“In the past, people have always emptied their clutter in donation boxes in churches, offices and supermarkets. Some of these things are never used by the children’s homes as some clothes are too big and the shoes too high or small”, OLX explains in a press release. OLX marketing manager Priscilla Muhiu says, “We see OLX as the solution because it is the only platform to sell the unused goods from homes to someone who needs it more. It is a win-win situation as the seller will declutter their homes by selling on OLX, while the needy children’s homes will get their preferred donations in form of perishables and toys too for the children”. DJ Soxxy explains further how the campaign will work, “after successfully selling unused goods on OLX, the sellers will go to any Tuskys supermarket branch and shop for dry food stuff or buy vouchers from Tuskys supermarkets which will also be used as the drop-off points”. Not all children homes in the country will receive the #SellToBless goodies though. The public will get a chance to nominate and vote for their preferred children’s homes through live TV-shows on Sunday mornings and on social media. The various artists will visit the selected children’s homes and hold concerts to entertain the children while delivering donations from the public. Some of the artists in the Sell to Bless Campaign are Citizen TV’s Willis Raburu, Abel Mutua of Hapa Kule, Njugush of real househelps of kawangware, Dk Kwenye beat, Size 8, Willy Paul, Bahati, Djs Mo, Johnie Celeb, Sanch, Krowbar, Touch, Soxxy, Gee gee, Njugush, Kambua and many others. The campaign will run for a period of three weeks from 16th March to 6th April, 2015. You will go to your house, audit the items in the house from beds to chairs to dishes to shoes to clothes to electronics to everything. Identify the items you no longer use or need – e.g. the items you would have donated to the needy via your local church, office or nearby supermarket. Don’t donate those items, sell them via OLX Kenya. Remember,it is easier to use the OLX App when selling through phone. After making that sale, do not use the money you make. That money is meant for the needy children in the various Children home across the country so visit any Tuskys and do shopping of any dry foodstuffs or buy a shopping voucher. Ask Tusksy’s staff where to leave the food stuff and/or voucher for OLX team to come and collect. Leave them there. OLX and the participating artists will collect these foodstuffs and vouchers from Tuskys and use them to bless the less fortunate and spread the Easter cheer. To a placard for sharing with friends on Faceboo, Twitter, Instagram and elsewhere, you will be taken to this link where you will upload the photo of the item you intend to sell for this particular campaign. 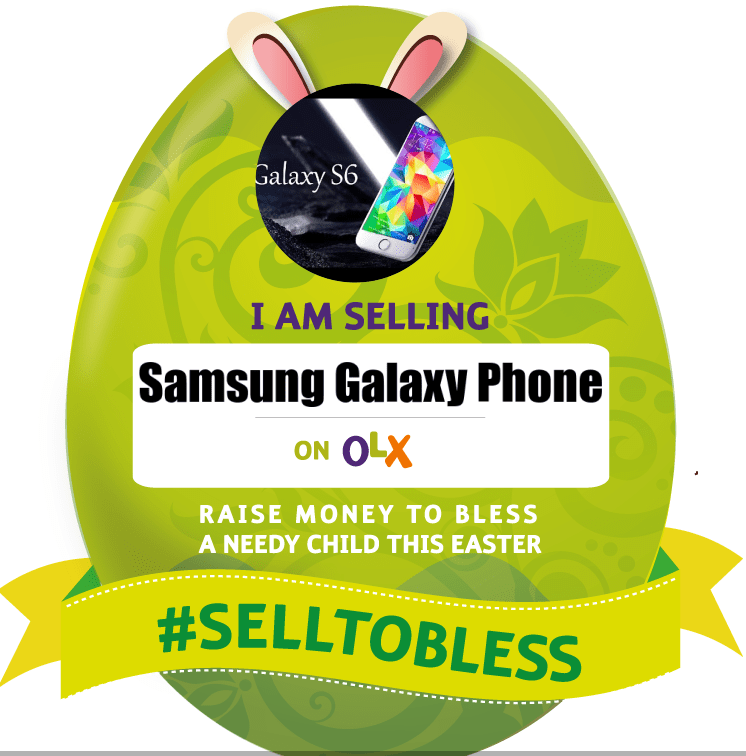 After providing the name of the item you intend to sell you’ll get a placard similar to the one below to alert your friends and others in your social media network to equally participate in the godly endeavor by OLX in partnership with the various participating artists. Instagram Now Allows You To Upload Videos.